The third annual “Chocolate Exposed” dining experience at Tulalip Resort is taking place February 4 through March 31, 2019. The chefs at Tulalip have created a seductive selection of savory and sweet chocolate dishes to captivate the most discriminating chocolate connoisseur. Here’s a look at what each restaurant at Tulalip will be offering. Chef Jeremy Taisey at Tula Bene Pastaria + Chophouse is whipping up a Chocolate-Citrus Tea Smoked Duck Breast with foie gras mousse, pickled cranberries, chocolate ravioli and fresh truffle with a puff pastry crisp. For dessert, diners can enjoy a 72% Chocolate Panna Cotta dessert, topped with a cacao nib crunch, extra virgin olive oil, sea salt and candied hazelnuts. At Cedars Café, it’s all about Chef Brent Clarkson’s S’ Mores Chocolate Waffles filled with chocolate chips and topped with marshmallow cheesecake and graham cracker crumble. Pastry Chef Nikol Nakamura’s sweet kitchen has added a special Chocolate Ganache Cream Pie layered with chocolate and banana to Cedars Cafe’s dessert menu during February and March. Chef David Buchanan’s Blackfish Wild Salmon Grill and Bar will feature a sinful Chocolate BBQ Chicken made with a 10-ounce Jidori Chicken Breast, house-made chocolate BBQ sauce, wild boar sausage, fingerling potatoes, wilted greens and pickled mushrooms. For dessert, there is the Baked Chocolate Mousse with coffee caramel and raspberries. At Blazing Paddles, there is the Triple Chocolate Dessert Pie made with Theo’s raspberry chocolate, mixed with white and dark chocolate chips, raspberry jam and marshmallows, then baked in their stone-fired pizza oven and topped with fresh strawberry slices. Eagles Buffet is featuring Chef Lil Miller’s Decadent Orchid Chocolate Raspberry Sorbet Sundae. Guests can revel in the orchid chocolate shell enrobing a sweet and tart Raspberry Sorbet, placed inside a house-made waffle cone. For a quick bite and respite from the gaming fun, visit the Resort’s Carvery and Hotel Espresso locations for the Spring Roasted Chicken Salad with crisp mixed greens, sliced oranges, cranberries, candied walnuts, goat cheese and a cacao balsamic vinaigrette. At The Draft Sports Bar and Grill, Chef Susan Jenson will be featuring a sports snack filled with Assorted Nuts that will be tossed in lightly spiced Ibarra Mexican cocoa. 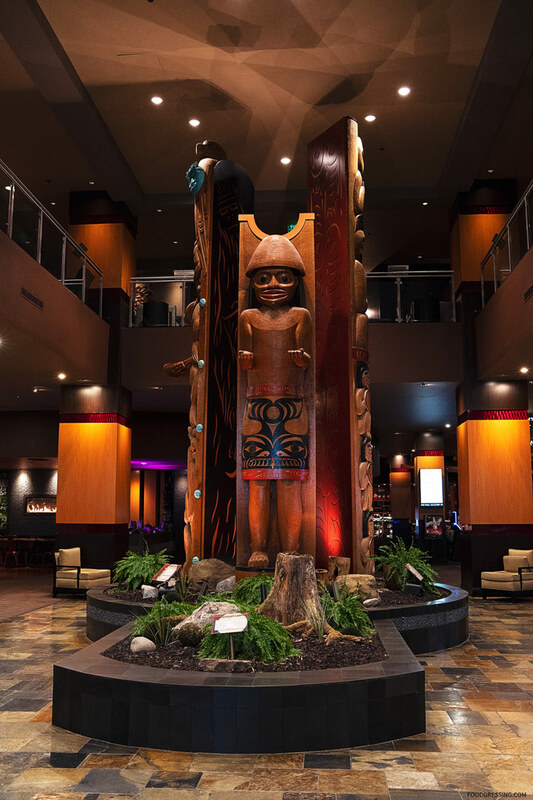 For more information about Tulalip Casino Resort, or to reserve a spot at one of the “Chocolate Exposed” restaurants, visit tulalipresort.com.